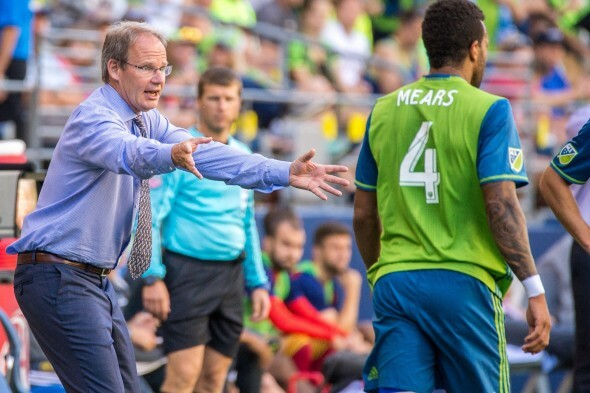 A win against Real Salt Lake at home Sunday would cap a remarkable turnaround by the Sounders and interim coach Brian Schmetzer, who is eyeing the full-time coaching job for next season. With a win Sunday at home against Real Salt Lake (1 p.m., ESPN), the Seattle Sounders will clinch a playoff spot in the Western Conference on the final day of the regular season. The feat would cap a remarkable turnaround after the worst start in franchise history, and avoid missing the playoffs for the first time in the club’s MLS history. For interim head coach Brian Schmetzer, the postseason would serve as a resume highlight to keep his name in the discussion of a permanent replacement for Sigi Schmid, who was fired midway through the season after the team started 6-12-2. Schmetzer, who hails from Seattle, played for the NASL Sounders from 1980 to 1983 and coached the USL Sounders from 2002 until their ascension to MLS in 2009. He served as an assistant head coach under Schmid since that then, and was the man to step up after Schmid was fired following a 3-0 loss to Sporting Kansas City July 24. Seattle (13-14-6, 45 points) has climbed from ninth in the West to fourth, and can guarantee itself a spot above the red line Sunday. If Seattle loses or ties, it can still advance, but will need either Sporting Kansas City or the Portland Timbers, each with 44 points, to lose or tie. If Seattle loses and Portland and Kansas City win, the Sounders will be left out. Sounders forward Herculez Gomez would like to keep the equation simple. “You never want to leave it up to somebody else to dictate what happens to you.,” Gomez said Thursday. “For us, it has to be business as usual. Our house is our house, it’s our fortress. Cliché and what not, it’s the truth. Schmetzer wants to have a career-defining moment; a triumph at home in front of a fan base that has responded positively to his coaching style and results. Schmetzer has been quick to push the credit for the club’s 7-2-4 run, including a six-match unbeaten streak that was snapped by a Oct. 16 loss to FC Dallas, toward players. Certainly, credit is due for the arrival of new designated player Nicolas Lodeiro, the healthy return of center back Roman Torres, and the maturation of rookie forward Jordan Morris. Gomez, however, said that Schmetzer deserves more credit than his humility allows. “He’s a smart enough guy to understand how this goes,” Gomez said. “The team wins, the players get (credit), team loses, it’s the coach’s fault. That old-school mentality, he’s old school like that. Guys respect that. Guys like feeling like their coach has their back. The theme was echoed in an interview Schmetzer gave MLSsoccer.com last week. Of course, Schmetzer may be out of luck if the team administration, particularly GM Garth Lagerway, decides he wants a higher profile name. Schmetzer may be seen as too much of a member of the old guard to help usher in the new era that Lagerway spoke of when the club signed Lodeiro, despite the respect for the longtime coach that Lagerway espouses. There is no doubt that Schmetzer has the respect of the locker room. “I’ve played for a lot of guys, and I can tell you not all of them were so great, and not all of them treat you with the respect that he treats you with,” Gomez said. “I think he’s still a young coach and he’s learning. It comes with the territory. But the respect is there. He puts the onus on you and he gives you accountability and responsibility. When those things are on you, you give your best into the team. The nature of the professional game means that coaches, players, and staff come and go. Personal connections and friendships form, but results ultimately dictate front-office action. Schmetzer has engineered a remarkable turnaround, albeit with a boosted roster. Sunday is a chance to spring a playoff push that burnishes the resume for the 2017 vacancy.